This recipe I had saved in my Epicurious recipe box for a while. Since I had fresh sage on hand from my last entry, I figured I could use it in this. As well I have a ton of spaghetti from a big sale the Key Food had a while back, so I'm making a lot of spaghetti. If you don't like spaghetti you can go to hell. This tasted great and I pretty much followed the recipe to the letter. However, I have to say the colour put me off a little. 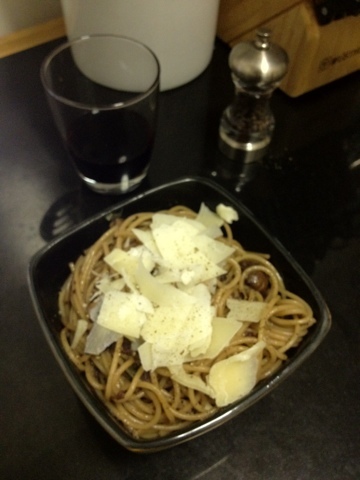 Not entirely sure why, but probably because I'm not used to reddish-brown pasta. 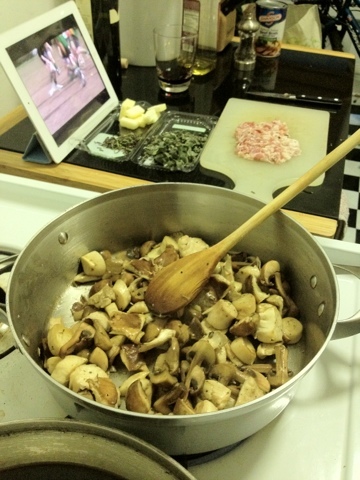 Still, all the mushrooms, the wine and broth reduction, and of course the pancetta were fantastic. 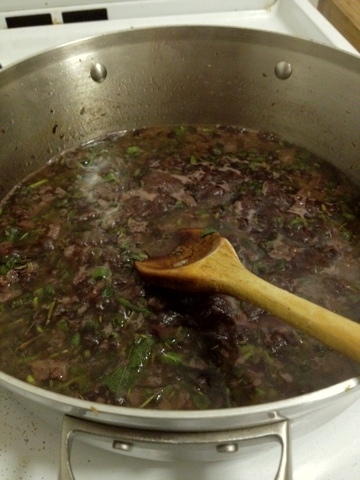 Reducing the wine and beef broth actually took the most time. Crimini and baby bellas coupled with some white mushrooms for this one. I used about half the recommended butter. 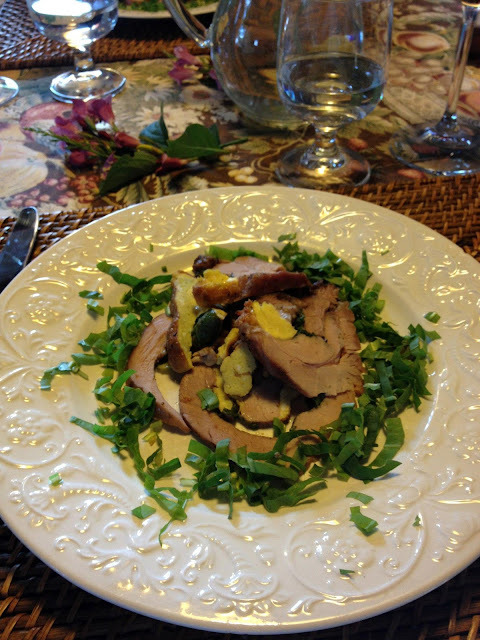 You can see it and the fresh herbs in the background along with the chopped pancetta. Finishing up the pasta in the sauce itself. The finished product. Tasty and lovely. Your soundtrack for this entry: Cathedral - Corpsecycle. First off, apologies for the blur in my last post. 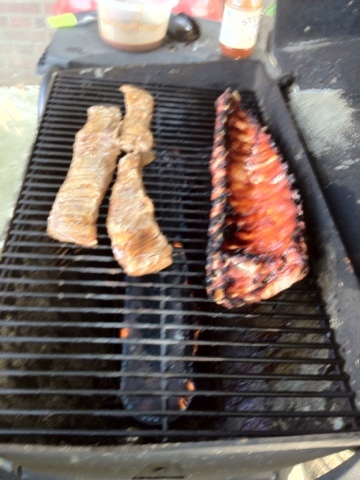 I admit, it was a lazy one, but then again I was busy cooking out and having a blast for the 4th of July. Must've had a pig and a half last week! Secondly, this post contains a recipe inspired by my recent trip to Italy. This one is quite simple, with only a handful of ingredients and not much more than 20 minutes prep time. It's also quite flavour-full! Heat up the water for the spaghetti while you're doing your other prep. 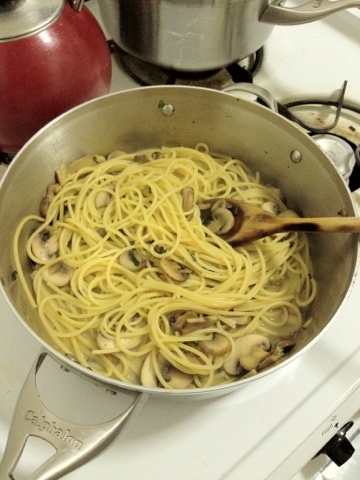 You should start cooking the spaghetti before you start the sauce. 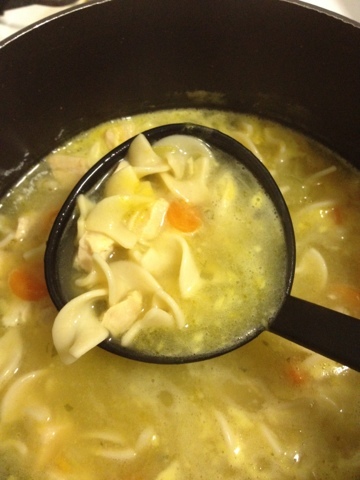 Cook it about five minutes until not quite done, then drain, reserving a half cup of the liquid. Meanwhile, in a medium saucepan, melt the butter over medium heat until bubbling. Add the sage and mushrooms. Cook in butter until tender. Now add your spaghetti and mix thoroughly. Cook another two to three minutes until al dente, adding reserved liquid if it gets dry. Serve into bowls and garnish with shaved parmesan, fresh pepper, and a sprig of fresh sage. Your soundtrack for this entry: Alice in Chains - Would? Labels: alice in chains, fresh pepper, fresh sage, parmesan, portabella mushrooms, salt, spaghetti, would? 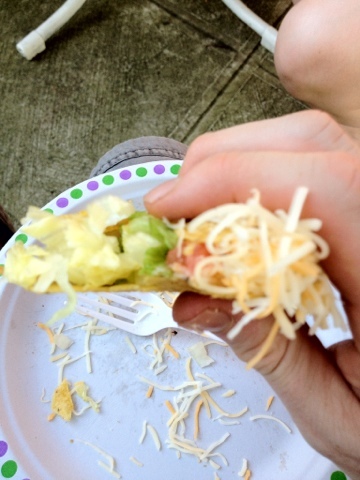 It's no secret that I don't have a grill. There's not even a courtyard in my building I could use. So when I get the opportunity to jump over to someone else's joint and use theirs, I definitely hop to it. My now former boss had a housewarming/going away party (it's complicated) this weekend. 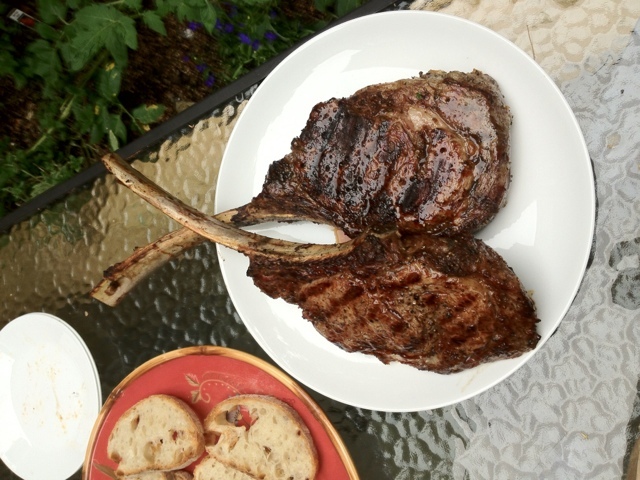 To see him off I got a pair of tomahawk chops for the grill. 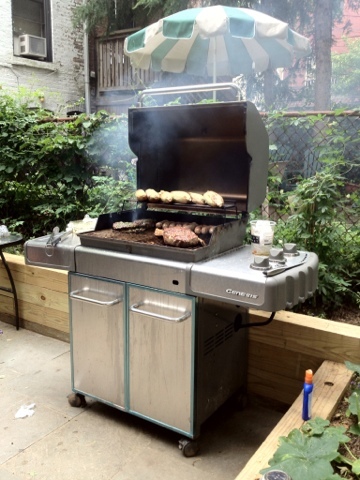 The grill I had to work with. It was fantastic. 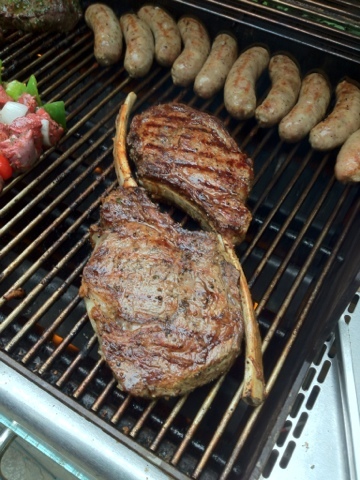 There you can see the chops front and centre, with some Argentine-marinated skirt steaks to the left, pork sausage behind, and roasting corn on top. 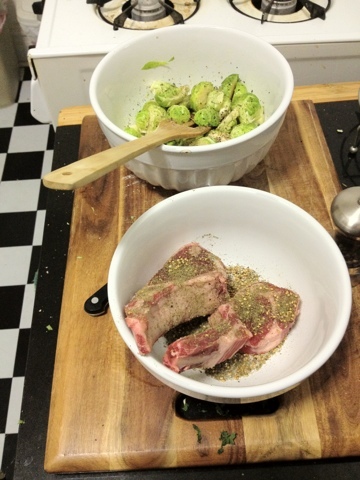 These are the wonderful chops. They are HUGE. This was a little over four pounds of meat, rubbed down with olive oil, and then sprinkled liberally with salt and pepper. When I want great meat of all kinds I hit up the International Meat Market in Astoria. My friend Sal always jokes that this is actually a bar down the street whenever I say I shopped at the meat market. The butcher who cut and frenched these chops was nothing if not an artist of the highest caliber. Your soundtrack for this entry: Michael Jackson - Rock with You. As alluded to in an earlier post (it's the one with clams), I recently traveled to Italy thanks to the Thrifty Sifter and her parents. Honestly, the food was generally so good that we didn't stop to take photographs most of the time. However, I wanted to share a few snapshots with you. Most of our time was spent in Tuscany, however we took a side trip to Ferrara to visit childhood friends. I lived there for three years when I was a kid and the bread above is one of my fondest memories. 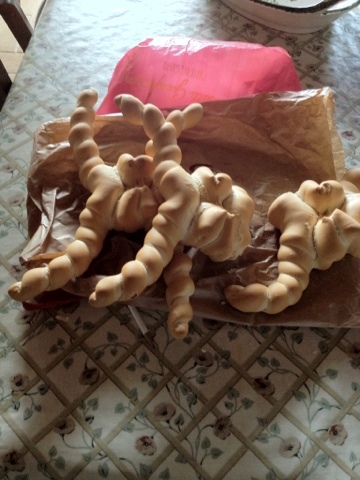 Coppia is the characteristic bread of Ferrara, with not too strong a flavour and an incredibly interesting shape reminiscent of crabs. Our base of operations was in a villa in Gaiole in Chianti. The first night we were there the housekeeper prepared dinner for us. 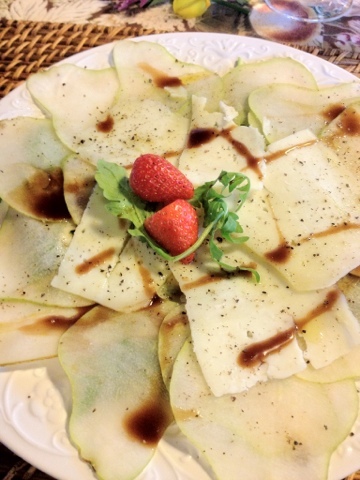 Above are some pears in a balsamic reduction with a local cheese. 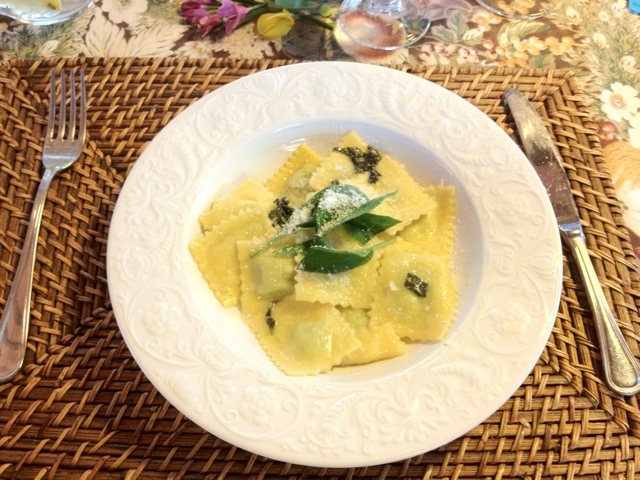 This are spinach and cheese stuffed ravioli cooked in butter and fresh sage. The housekeeper called this turkey, but I'm 99% sure it's actually pheasant since it didn't quite taste like turkey and pheasants were running around the fields. It's stuffed with eggs and herbs, then roasted. 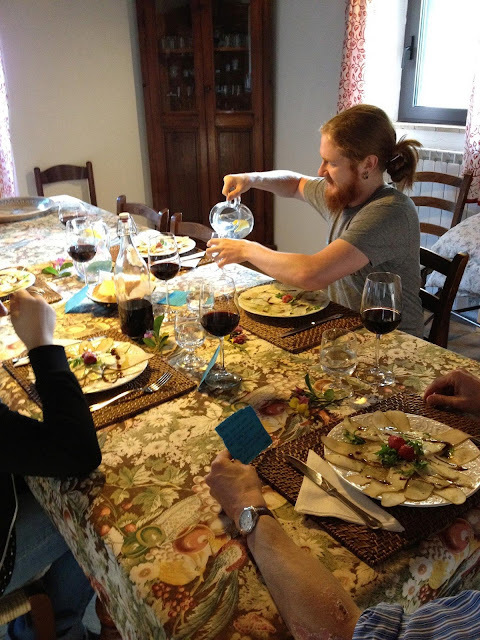 Here I am enjoying the pears, water, and a homemade chianti with the Sifters. 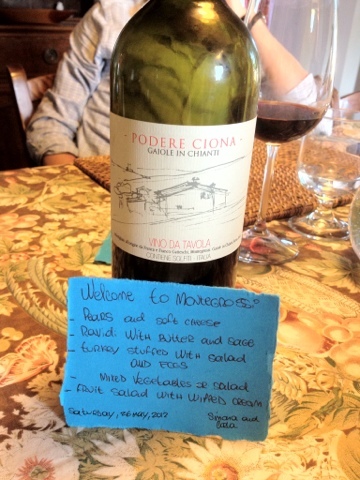 Our menu for the first evening with a local table wine. 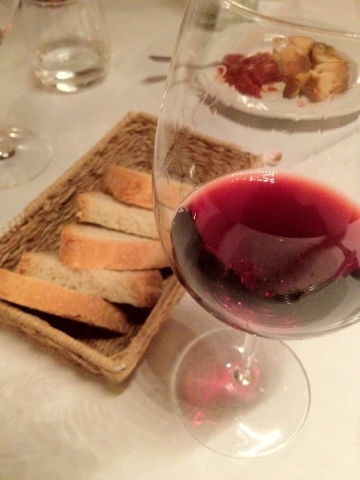 Some chianti classico we had in Siena. 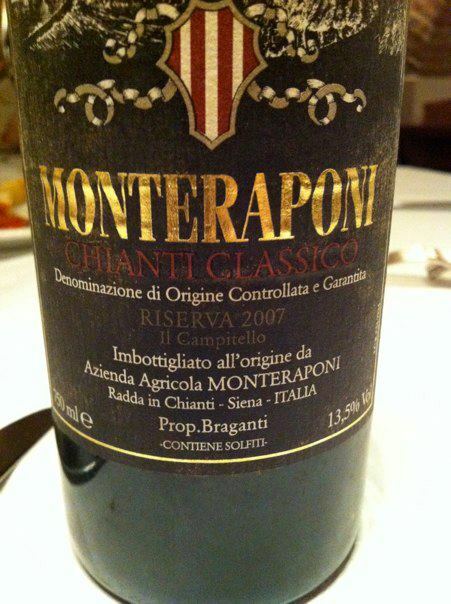 There are some minor differences between chianti classico and chianti. With some local bread. Personally I found a lot of the Tuscan bread to be tasty, but somewhat bland. 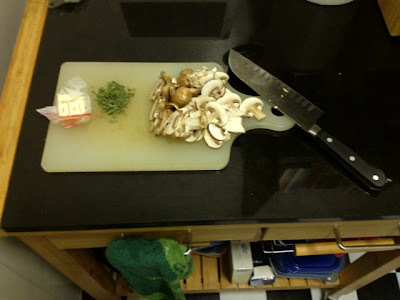 This is, from what I hear, on purpose so that you can add flavour with olive oil or making a bruschetta. If anyone cares to enlighten me further, please do! Your soundtrack for this entry: Furykane - STFU. Yup, I went to the bodega and got canned chicken soup. Your soundtrack for this entry: me sneezing. I came so close to making fish. 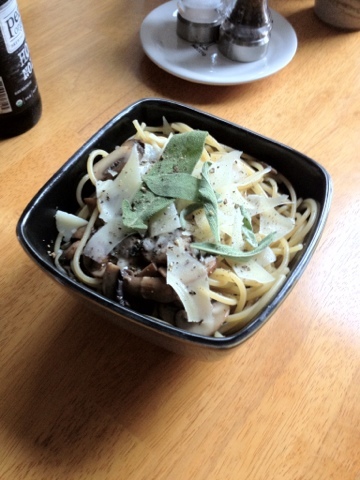 Then it was almost another pasta. 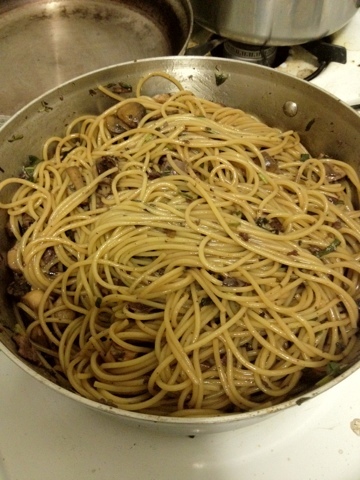 Then I figured just because I love pasta, you dear readers would think that's all I could make. Bah! The lamb caught my eye and the lamb's what I made. My arteries probably hate me now, but who needs them? So, what's za'atar? Until a few months ago I didn't know either, but the Thrifty Sifter made some of her own and conveniently left it at my place. Essentially it's a Middle Eastern equivalent to salt and pepper in that it's the spice. Serious Eats has a more in-depth za'atar description. It goes great on meat, as I proved to myself last night. Overall this was an extremely simple dinner to make. To paraphrase Heidi Swanson, whose golden crusted brussels sprouts entry I perused, this isn't much of a recipe. Hell I would barely consider the above a list of ingredients. You can essentially follow her directions for the brussels sprouts. The only change I really made was using shaved parmesan. Also, you should take her advice about using small sprouts. I'm battling a cold and don't feel so hot, so I rushed through the grocery store produce section instead of hitting up my regular United Bros. Fruit Company across the street. 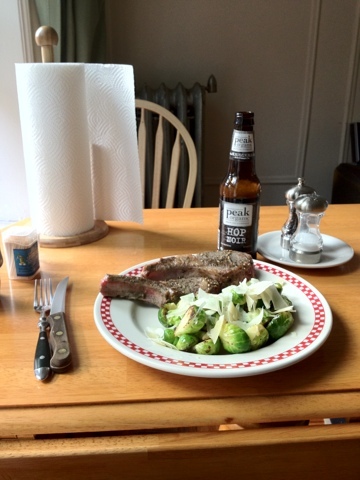 Some of my sprouts were on the large side and, yes, they burned and didn't make it to the final plate. The lamb chops are a simple affair, too. Sprinkle salt on both sides, grind pepper on both sides, and dust both sides with za'atar. 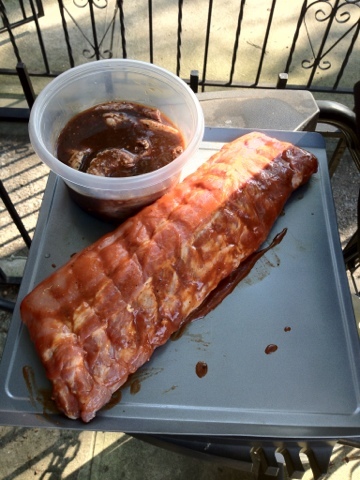 Let sit for 15 minutes or so, then sear them in a skillet over medium heat to desired doneosity. Let them rest a few minutes and serve. And yeah, even though I'm sick, I had to have a beer with dinner. 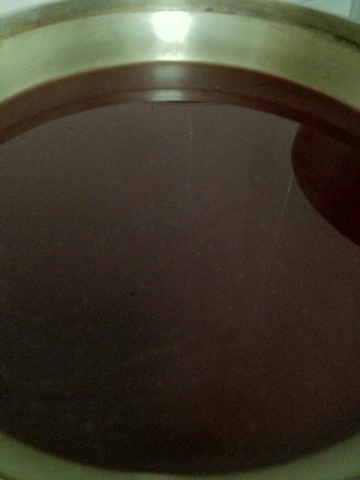 That's a Hop Noir from Peak Organic, a black IPA. NOM! Your soundtrack for this entry: Ghost - Ritual.